"We share a commitment with RIAs of putting clients at the center of everything we do. These ads celebrate advisors’ independence days – the actual day they went independent – and highlight the reasons they chose this path and how Schwab has helped them do what they love best – serving their clients." SAN FRANCISCO--(BUSINESS WIRE)--Schwab Advisor Services today announced a new national advertising campaign focused on celebrating independence, which will run in trade publications, in online banner ads and on social media channels beginning this month. 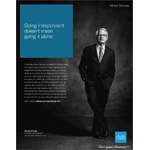 The new campaign kicks off with a print ad featuring The Charles Schwab Corporation’s Founder and Chairman Charles ”Chuck” Schwab commending the independent advice model and underscoring Schwab’s continuing, industry-leading commitment to independent registered investment advisors (RIAs). The next phase of ads will launch online mid-June and will feature three independent RIAs who custody with Schwab highlighting their personal story of independence. Future ads will feature additional independent advisors who custody with Schwab. The ads align with Schwab’s corporate brand platform – “Own Your Tomorrow” – which launched last summer and portray advisors who made the move to independence with guidance, support, and insight from Schwab. Advisors highlighted in the new campaign include: Deb Wetherby from Wetherby Asset Management, Ajay Gupta from Gupta Wealth Management, and Brett Sharkey from Three Bridge Wealth Advisors. The campaign was created by Crispin, Porter + Bogusky, Schwab’s agency of record. The print ad featuring Chuck Schwab will run initially in InvestmentNews. The advisor prints ads will be placed in Financial Advisor Magazine and REP with online banner ads running mid-June in InvestmentNews, Wealth Management and on CNBC.com. As part of the campaign, Schwab Advisor Services will also be the exclusive sponsor for a new special report featuring advisors titled, “Advisor to Advisor” on CNBC.com launching in June. Schwab Advisor Services is an active advocate for RIAs, engaging in a wide range of efforts to support and advance the independent advisory industry. Activities include donations to non-profit organizations and universities, as well as providing a voice in Washington, D.C. on regulatory and public affairs issues impacting RIAs. Schwab Advisor Services honors leading RIAs and advisors annually through its nationally-recognized IMPACT Awards® program and is the driver behind RIAStandsForYou.com, a multi-media educational campaign that aims to support the independent RIA category and increase awareness of the independent advisory model among high net-worth investors.